When spring hits, whether it’s “official” or feels like spring, many of us are eager to get out of the office and into the fresh air. However, too much rain or thawing snow after a long winter from mountains can bring severe flooding. Floods are the most common and costly natural disaster in the United States. Here are some things to keep in mind as the spring flood season draws near. Never drive or walk through flooded streets. It only takes six inches of moving water to sweep a person off their feet (and not in the romantic way) and 12 inches to move a car. Remember, if a street is flooded, Turn Around; Don’t Drown. If floodwaters rise around your car but the water is not moving, abandon the car and move to higher ground. Do not leave the car and enter moving water. 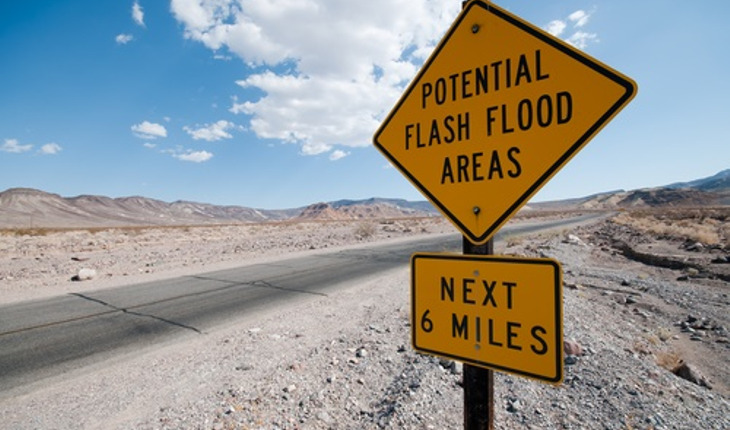 If there is a chance of flash flooding, move immediately to higher ground. Flash floods are the number-one cause of weather-related deaths in the U.S.
Talk with your family and make an emergency plan for you and your pets. No matter the disaster, it’s always a good idea to have emergency supplies, including flashlights, batteries, cash and first aid supplies, at home, at work, and in the car. Most insurance does not cover flood damage. Only flood insurance will cover the damage from floods. Speak with your insurance agent to learn more and remember flood insurance takes 30 days to take effect, so purchase now to protect your family! You can learn more about the dangers of flooding at Ready.gov/floods.